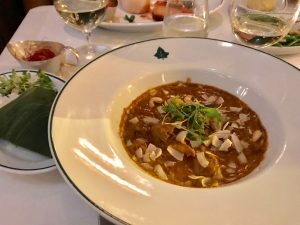 To complete my trial of the new St Andrew Square restaurants, this week I had the good fortune to try out gluten free options at the new Ivy restaurant. And I was definitely not disappointed – it was fantastic. The Ivy bills itself as “casual dining”, but this doesn’t mean the quality isn’t there: the service, food and wine is all of the highest standard. The waiting staff were immediately alert to thinking about GF eating and when my gluten-eating neighbour was brought slices of toast, the waiter shifted it across “because of contamination” – what a good sign! I enjoyed the most amazing starter of scallops with a broad bean puree – which was zingy and tasty, I just loved it. 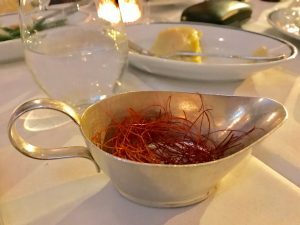 This was followed by one of the best curries I have ever eaten: a superb, fragrant duck curry with cashew nuts, a pouch of jasmine rice and a little silver jug of tiny strands of chilli – for me to scatter on the top to the desired level of heat. This curry just blew me away! It was lightly flavoured, letting the flavour of the duck come through; and it was tender with a depth which the tiny pieces of chilli cut through. Just completely and utterly delicious – I have to go back. Others enjoyed great meals too: a seared square of trout, olive mash, burgers with super-fat chips; generally it was all just the most delicious food. We also had some great gins to start, followed by a wonderful, flowery Albarino (my favourite!). Pudding options were good for GF too, including a chocolate pudding, ice creams and sorbet (as always! ), and a tiny bowl of salted caramel truffles which I enjoyed with a cup of peppermint tea (served in a very glamorous silver teapot). The Ivy is a bustling and lively place, with terrific service and a good choice and understanding of coeliacs and gluten free eating. Despite what you might expect, it is also good value for the standard of food on offer. It would be ideal for a family party or group of friends. I shall certainly go back again and again.